Touches of blush in the chevron-patterned upholstery and matching accent pillows, along with plenty of white, keeps these pink walls from overpowering the serene setting. Gray is still the main neutral for 2019. Introduced in 2016, gray began replacing beige as a mainstay. A great spatial neutralizer, gray can minimize the impact of a too-high ceiling or make a long room look more proportionate when used on a far wall. The undertones found in gray make it appear warmer or cooler. A pearly gray is a great background for all silver toned metals, but pairs just as well with gold accents. Today’s design actually prefers a mix of metals for more interest. Green is a growing favorite among designers for 2019, for a variety of reasons. It’s pleasant and easy on the eyes, pairing well with many colors, including gray. There was a lot of green shown during my recent visit to the Fall market in High Point, North Carolina. High Point Market is the largest furnishings industry trade show in the world. Open only to the trades, every six months more than 75,000 design professionals visit the 11.5 million-square-foot showspace housed in 180 buildings where more than 2,000 exhibitors feature the latest design trends. Beyond its vibrant hues, green speaks to sustainability, even influencing how some pieces are manufactured. Bamboos and grasses are a good example. Fast growing and sustainably forested, these materials are being used in interesting ways—in tabletops for instance. Green blurs the line between indoors and outdoors, which is how most of Southwest Florida lives, making green a great color choice for Naples—many people come here because they love our outside-in lifestyle. Blue is huge, and for good reason. There is no other combo more classic than blue and white. Think ginger jars, or a blue blazer with white shirt and jeans…you can’t be without blue anymore. From sea glass to cobalt to indigo, designers love blue because it can be paired with so much. It’s gender neutral. It’s location non-specific; you can use blue by a tropical beach, on a rocky New England shoreline, or in the midst of mountains. Pink is fun! A good example is Lily Pulitzer with her bright, cheerful prints. In home décor, pink has become grayed out to a pale blush which pairs well—not surprisingly—with gray. Blush also blends perfectly with neutral creams. Accent pieces are showing up in velvets, with more curves, giving everything a softer silhouette. These steady players are being paired with strong colors like purple, red, and the crowning touch of gold. With their background in royalty, those accent colors provide drama and promote luxury, two qualities people are once again seeking out. 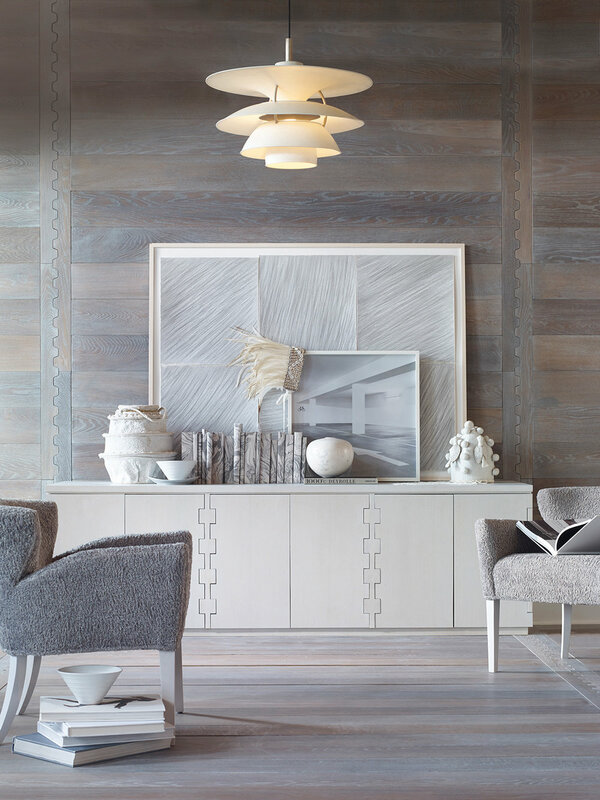 With walls, floors, upholstery, and accessories all soothing shades of neutral gray, the emphasis in this vignette is on shape and texture. Patterns have always had a place in fabric design. In the past they have been neutral, with a little metallic or a little animal print. Nowadays patterns come in strong, bold florals, stripes and geometrics. Nor do you have to pick just one pattern, they are mixed together, sometimes on the same piece of furniture! In many cases older patterns are emerging, but they are being recolored to fit today’s design schemes. Undoubtedly you have encountered Sunbrella® or other high performance fabrics. We couldn’t enjoy our Southwest Florida lifestyle without these fade- and stain-resistant materials fashioned into our outdoor furniture. They provide luxury with the ease of comfort and durability. Why not bring them indoors? When you flip through magazines, it seems like every room has a white sofa—well you can have one too! When choosing your next piece, ask for performance fabric. If the thought of spinning the color wheel has your head spinning, get a professional who understands color to help you with paint and furniture selections. Shop your closet too! The blue shirt that brings out your gorgeous eyes? Chances are that hue will do the same for you when used in your home décor.